Buster Moon (Matthew McConaughey) is a plucky koala who owns a music theater. Lately, his productions have bombed and now he is in financial trouble. He loves the concert hall for it has a rich history. In an effort to save his failing business he decides to hold a singing contest, not unlike American Idol. He starts by holding auditions and we’re introduced to an interesting assortment of animal critters. 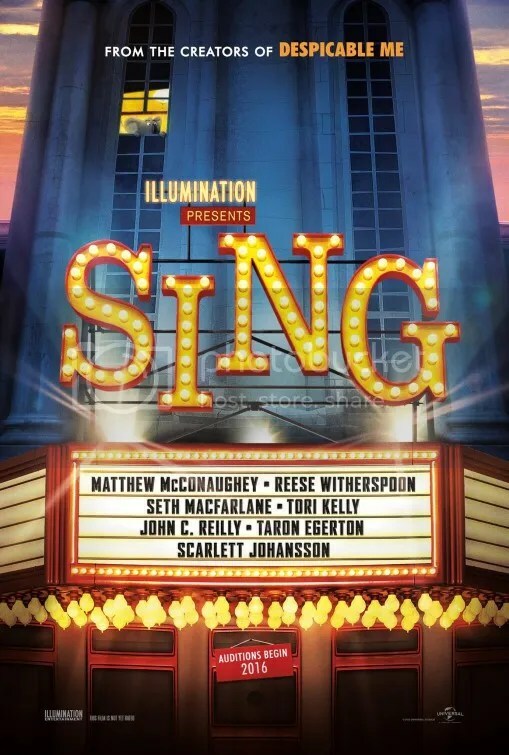 Sing is the latest offering from Illumination Entertainment, the animation company owned by Universal Studios. They scored big this Summer with The Secret Life of Pets and it looks as though they’ve got another major hit on their hands. Sing gets a lot right, starting with juggling a colorful cast with ease. The screenplay wisely takes the time to thoughtfully delve into the backstories of various individuals. We become emotionally invested in these critters. Five leads emerge: Rosita (Reese Witherspoon) is a pig who is a devoted wife and loving mother. She longs to return to the entertainment spotlight of her teenage years. Mike the mouse croons like Frank Sinatra and has got the confidence to match. Ash is a porcupine who comprises one-half of a punk rock duo with her arrogant boyfriend Lance. She can belt it out, but hasn’t been given the chance. Meena is a shy teen elephant with an incredible voice. Unfortunately her crippling stage fright holds her back. Lastly, there’s Johnny (Taron Egerton), a British mountain gorilla. He longs to perform, but his father wants him to take part in the family’s criminal escapades. These characters occasionally touch on ambitions that can be a bit clichéd. They may follow conventional tropes but they manage to engage. These are reasonably well-developed personalities with some unexpected depth. The narrative could have easily worked as a live action movie with human actors. “Sing, sing a song / Sing out loud / Sing out strong…” sang Karen Carpenter in a 1973 hit song penned by Joe Raposo. Oddly enough, that similarly titled ditty is NOT included in Sing. This jukebox musical contains over 85 tunes ranging from 1940s standards by Frank Sinatra to current pop singles. These are heard throughout both in the background of scenes or sung in competition by the contestants. The compositions work and many actually feel as though they were written for the drama. Katy Perry’s “Firework” as sung by Rosita (Witherspoon), and Elton John’s “I’m Still Standing” sung by Johnny (Egerton) as his climatic number at the end, are galvanizing pop hits that pluck your heartstrings. Johnny’s incarcerated father discovers his son’s vocal talent from the TV in his jail cell. I can’t explain why I got choked up, but I did gosh-darn it! There’s a lot here that feels familiar. I mean did we really need yet another version of Leonard Cohen’s “Hallelujah”? Please retire that ballad immediately. Nevertheless, I freely admit that it’s beautifully sung here by Tori Kelly. 2016 has been a stellar year for animated films. The bar has been raised incredibly high. Sing doesn’t reach the heights of the year’s very best (Zootopia), but I still left the cinema with a smile. This entry was posted on December 26, 2016 at 11:24 pm and is filed under Animation, Comedy, Drama, Family, Music, Musical with tags 2016. You can follow any responses to this entry through the RSS 2.0 feed. You can leave a response, or trackback from your own site. We are on same page with this one. Sure it’s a cliched story and not all elements work but I walked out enjoying myself. I liked the characters especially Rosita and the full songs were well done. I did enjoy this and I wanted my review to convey that. I touched on this in my review, but some of the songs have been so overused in modern times that they have lost their power. “Hallelujah” was once a great song but it’s about as common as “Happy Birthday” at this point. Yeah agree with you there. I also felt it was in poor taste that all the gangster-type characters were either black guerillas or brown bears. Mix it up a bit! I really enjoyed this. Lotsa of fun. I actually got teary eyed a few times. Each character had a great story to them. Singing was great too. Fun, fun fun. 4 stars. Next to Rogue One, this was THE big hit of the holiday season even outgrossing Doctor Strange, Moana and Fantastic Beasts. Wow. Was bummed that I missed Sing, since it seemed like it would be a cute, fun movie. Happy to hear that it juggles a colorful cast with ease and thoughtfully explores the backstories of the various characters. Sounds like there is a good mix of music and some touching moments. I’ll be sure to check it out! I enjoyed Sing, although I’m surprised it did better than Moana at the box office. Critical reviews were less enthusiastic. Just reinforces the idea that critics’ tastes are not the same as the general public’s.